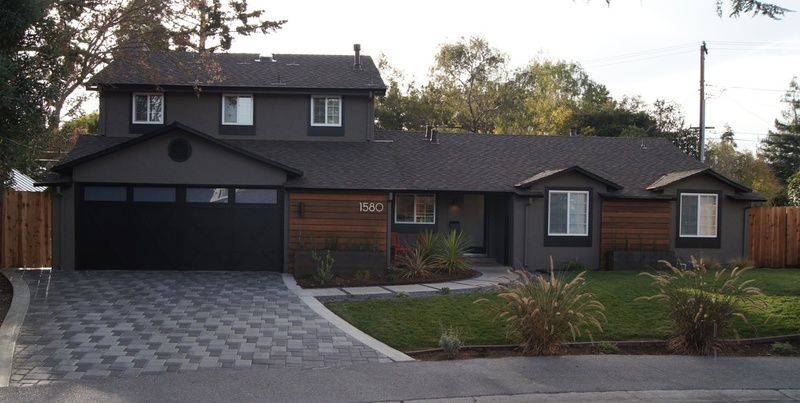 In a previous post, I mentioned that we were in the throes of a facade make-over for our recently purchased home in Mountain View, CA. When we broke ground on this project, many of our wonderful neighbors would stop by to chat and manage a very polite, "what's wrong with the way it is now?" Our home when we purchased it, post flip. It's a fair comment because our house was flipped right before we purchased it. It had just been outfitted with new windows, doors, paint, roof and landscaping. So yes, everything was new, but unfortunately, the flippers made some cost-saving design decisions and aesthetic choices that made it challenging for us to feel "at home" in our new house. For example, from a distance the garage door appeared to be a Craftsman style wood door with rustic wrought iron hardware. Cute, right? But a closer look revealed it was actually a metal garage door painted to look like wood with cheap faux hardware and plastic dividers making the 4 window panes look like 12 smaller panes. And note the window above the garage door - which is actually not a window at all but a black piece of plastic outfitted with faux shutters to make it look like a window. I could go on, but I think you get the idea. Basically, good from far but far from good. Instead of replacing the nearly new garage door, we removed the faux hardware and window pane dividers, painted it black to match the trim (and hide the wood grain embossing in the metal) and used a film on the windows to match the new glass panel front door. Three of my favorite details of the new design are captured here: the new house numbers (which are 8" tall and lit with a spotlight at night), the Ipê wood siding, and the custom raw steel planters. New laminated glass panel front door with lovely hardware, new lighting, mailbox and board and baton siding to cover the old brick, which also allowed us to run electrical for a hardwired doorbell. Another genius idea from our designer: cut channels into the existing concrete path and lay pea gravel between and around the path. Add some succulents and voila! We absolutely love the transformation and feel like this house is finally our home. And the neighbors have been so complimentary and appreciative of our efforts. It was a worthwhile investment as I'm sure we would see an ROI if we were to sell, but I'm much happier being able to come home to this beautiful house every single day and we will enjoy it for any years to come. And FYI - here's what the house looked like before the flip. A dramatic transformation indeed! Our home in 2011, pre-flip.